New behaviors typically arise from the co-option of existing morphological systems for new functions. But what happens to the evolutionary trajectory of a structure when it begins to be used for a new behavior? The ability to bury underneath the sediment has convergently evolved many times among fishes. Representatives from at least four of the groups demonstrating burial behavior can be found at FHL, and each group uses a different set of structures to accomplish this task. Some of these groups are very diverse (e.g., flatfishes, 800+ species, 9 species at FHL) and some are evolutionary one-offs (e.g., sandfish, one species). My mentees can choose to study either the evolution of morphology involved in burial behaviors, the function and biomechanical performance of structures involved with burial in live fishes, or a combination of both evolution and function. 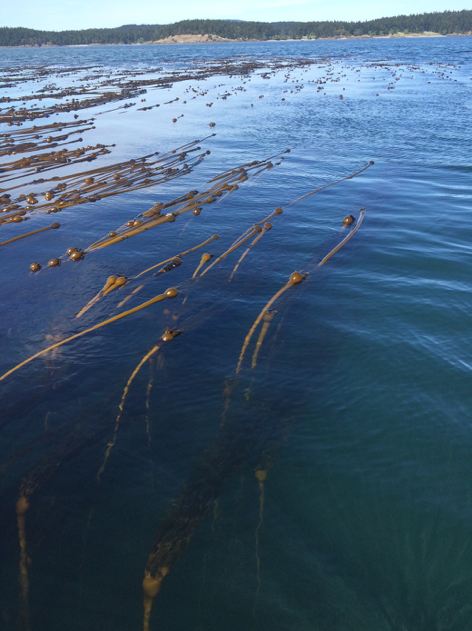 The bull kelp Nereocystis luetkeana is an annual kelp species that provides the bulk of the complex three-dimensional habitat space in rocky subtidal habitats of the San Juan Islands and elsewhere in Washington State. There are a variety of potential projects that focus on investigating biotic and abiotic factors influencing bull kelp across their complicated life history using a combination of lab and field work. 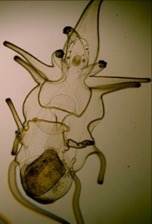 Topics of interest include Northern kelp crab (Pugettia producta) feeding preferences (in the lab) and distribution and abundance (in the field, using snorkel or SCUBA surveys); contribution of P. producta feces to detrital food webs (in the lab, using the intertidal copepod Tigriopus californicus); effect of intraspecific and interspecific competition with invasive Sargassum muticum on growth of juvenile N. luetkeana (in the field, using transplant experiments); and the relationship between maximum force exerted by crab claws and crab food preferences (collecting organisms in the field, testing in the lab using P. producta as well as shore crabs, genus Hemigrapsus). Subtidal data collection using SCUBA may possible for a student who is already a trained scientific diver at an AAUS member institution. A better understanding of the dynamics of N. luetkeana beds in the Salish Sea is crucial not only because they create valuable habitat for economically and ecologically important species, but also to inform management decisions and restoration efforts in a changing ocean. The evolution of facial asymmetry in flatfishes is one of the most prominent and bizarre departures from the vertebrate body-plan. 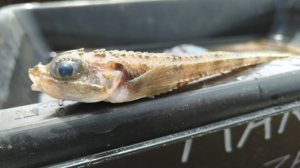 Over a short period of time during the larval phase of flatfish species one eye migrates nearly completely to the opposite of the head as the fish transitions to a benthic lifestyle. 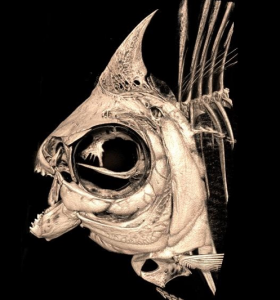 In this project, we will use CT scanning and geometric morphometrics to study the evolution of skull shape in flatfishes and their relatives. Students will gain valuable experience operating a micro-CT scanner and learning how to segment high-resolution slice data. They will also gain experience analyzing three-dimensional shape data and analyzing multivariate datasets in a comparative phylogenetic framework. Durophagous fishes consume hard prey, such as snails or crabs, and typically overcome their prey’s defenses by crushing them with sets of robust teeth and powerful jaw muscles. While Asemichthys taylori (Family: Cottidae) is durophagous, these relatively tiny fish appear to use their vomerine teeth for puncturing small holes in snail shells as opposed to crushing. If unpunctured, snails have been reported to emerge alive and intact following the process of digestion1. 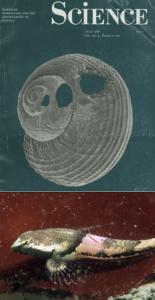 How then do these relatively tiny fish generate the necessary forces to puncture the shells of these snails, effectively facilitating nutrient uptake? Accomplishing this goal will require us to conduct in depth investigations of the system’s form and function to understand the biomechanics behind the mechanism. 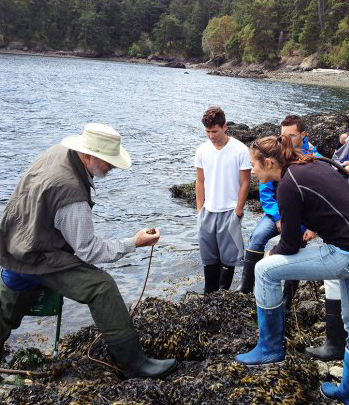 Over the course of this program students will learn a number of techniques including fish collection from tidepools, video analysis of feeding motions, SEM, 3D printing, mechanical testing, and CT scanning and segmenting. Animals and plants are formed of myriad material components, from sinew and bone, to bark and leaves. These tissues have varying properties, with some more flexible and tough, while others are brittle and strong. Consumers must be able to break down these materials to access the resources they need to grow, reproduce, and survive. We might expect then, that herbivores are shaped differently than carnivores, given the unique mechanical difficulties in breaking down cellulose and silica-infused plant stalks, relative to crushing bone and tearing flesh. The Amazon basin has the highest diversity of freshwater fishes in the world (>25% of all fishes). The basin’s many rivers blend together during seasonal flooding into ‘varzea’, or flooded forest. Varzea is packed with diverse herbivorous fishes, which consume flowers, fruits, and seeds of plants submerged in the forests and are important seed dispersers. In the Summer of 2019, we will explore how the overall form and function of South American characiform fishes (tetras, pacus, piranhas, etc.) is tied to the material composition of their prey. Specifically, how the strength and performance of fish skulls and teeth relate to the toughness of their chosen food. Using micro-computed tomography scanning (micro-CT) of museum specimens and a material testing station we will (1) quantify shape change in the feeding apparatus of Amazonian characiform fishes, (2) build computational models of how skulls perform while biting, and (3) determine the material properties of a vast variety of tropical fruits, seeds, and nuts. Students will learn: (A) how to use CT scanning and morphometric methods to quantify functional differences in skeletal and soft tissue anatomy; (B) how to build computational engineering models of fish skeletons; (C) the basics of materials science and biomechanical testing using a mechanical loading frame; and (D) how to examine the evolution of traits using phylogenetic comparative methods. This research is in collaboration with international researchers from the George Washington University, University of Michigan Museum of Zoology, and the Royal Ontario Museum. 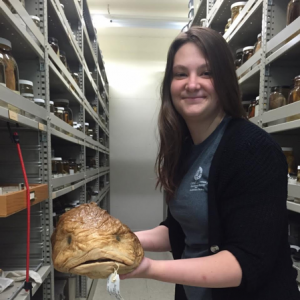 Past students have presented their research at international meetings of the Society for Integrative and Comparative Biology (SICB) and several exceptional students are coauthors on publications published in the Royal Society, Anatomical Record, and elsewhere. The ochre star (Pisaster ochraceus) is an important predator in the rocky intertidal, eating a wide variety of prey across many trophic levels (e.g. barnacles, chitons, snails, etc). Our understanding of P. ochraceus as a keystone predator originated from the strong trophic link between mussels and P. ochraceus, which was apparent when the stars were removed from a mussel-dominated system. P. ochraceus is abundant even on coastlines that do not support mussel populations, however, most of the research exploring the top-down control P. ochraceus exerts has taken place on the western coast of the US where mussel beds tend to dominate the upper intertidal zone. What happens when this top predator is removed from a system in which mussels are not present? In this project, we will explore prey community assemblage in the absence of P. ochraceus in the San Juan Islands, which do not support large populations of mussels. These interactions will be tested through the use of plot clearing and exclusion cages to manipulate prey and predator composition in the field. These experiments are amenable to comparisons across tidal heights (lower intertidal vs higher intertidal exclusions), a temporal scale (summer data vs previously collected spring data), or sites (long term sites vs a new site). Additional surveys of P. ochraceus populations via snorkeling (cold water!) are optional but available to those interested, with limited gear available to lend. Although this is part of a larger project, it will easily accommodate the student’s interests and ideas. Fishes display an incredible variety of mechanisms and morphologies to capture prey. I am interested in the selective pressures that shape these feeding structures: how can some fish capture elusive prey, while others can filter tiny particles out of the water? 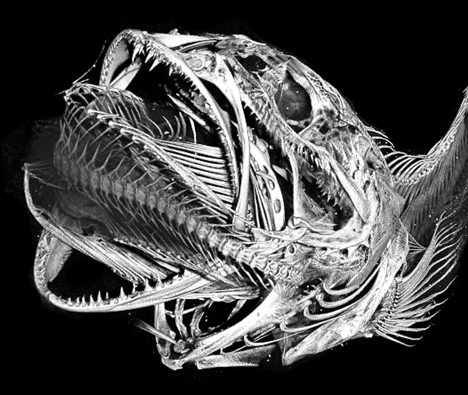 My research evaluates why fish mouths look the way they do, from their gills to their teeth. The shape of feeding structures is often the result of a compromise between function and selection. By looking at how teeth resist breaking during puncture or why the gill arches are shaped the way they are, I can answer questions about how function influences shape. For instance, in order to puncture a prey item, teeth must do two big things: pierce through the tissue, and bring that tissue into the mouth without breaking. This seems like an easy task, but each problem has a different functional solution. Slender and sharp teeth are excellent for puncturing, but more prone to breaking than wider teeth; which can’t puncture as well. Moreover, the way we currently describe teeth only focuses on shape and misses a great deal of the variation. Utilizing 3D CT scans, modeling, and morphological characters of shape and position we can evaluate what functions (load, stress, replacement, etc.) enforce particular tooth shapes. I am also interested in how the microstructure and material properties of teeth play a role in how well they deflect stress regardless of shape. Using histology, material testing, and modeling we can see how similarly shaped teeth may be built to resist different forces. Filter feeding fishes also have to capture and swallow prey, but they face problems of an entirely different scale: their food is vanishingly small. How do you set up the initial flow to even be able to eat such small prey? Rather than their teeth, filter feeders have modified parts of their gill arches, specifically their gill rakers (bony protrusions that extend off the arches) that manipulate the flow of water to capture tiny particles. Looking at the shape and spacing of the gill rakers and arches, my research investigates how important flow control is in the mouth and what controls this flow field. This project utilizes CT scanning and large databases to explore an underused axis of variation, highlighting large-scale trends in gill raker and arch diversity. Seagrasses are critical biological engineers in that they can transform two-dimensional, muddy habitats into three-dimensional, complex meadows that support entire food webs – ranging from tiny crustaceans to fishes to people. They also enhance important ecosystem services, such as carbon sequestration and shoreline stabilization. Global seagrass populations, however, are in decline due to a multitude of stressors. 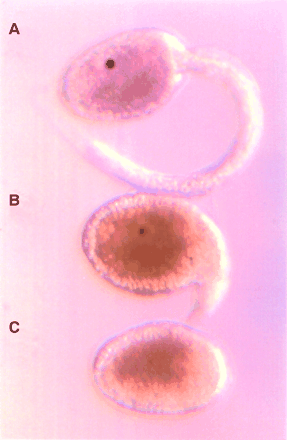 One such stressor is seagrass wasting disease, which is caused by a protist slime mold called Labyrinthula. Although we are learning more about what might promote increased wasting disease (e.g. higher temperatures), we do not understand the physiological responses that underlie the interaction between a seagrass host and the disease. It can be reasoned that combating the disease incurs an energetic cost (carbon reserves), which is supported by the energetics associated with the identified plant characteristics that correlate to disease (see Groner et al. 2016). In this REU experience, we will work together to run an experiment that aims to quantify carbon reserves (i.e. sugars and starches) in seagrasses that are infected with wasting disease and in disease-free plants. If logistics allow, we will also incorporate a temperature treatment in the experiment because temperature is a leading driver in both carbon metabolism and quantified disease load. This work will be an important contribution in better understanding the line between physiological resilience in seagrasses versus disease outbreak. Groner M.L., Burge C.A., Kim C.J., Rees E., Van Alstyne K.L., Yang S., Wyllie-Echeverria S., and Harvell C.D. 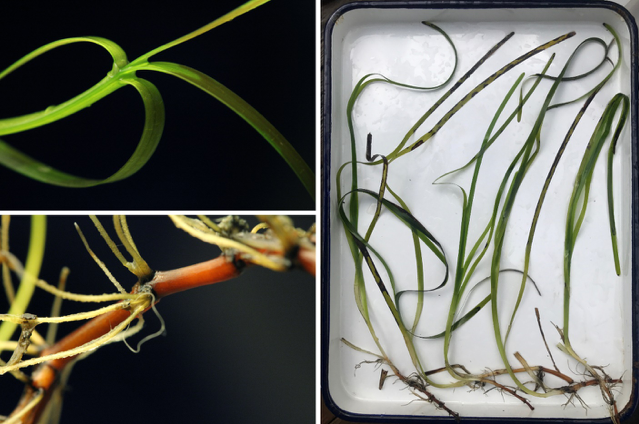 (2016) Plant characteristics associated with widespread variation in eelgrass wasting disease. Diseases of aquatic organisms, 118(2), 159-168. 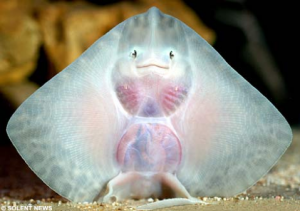 Skates (relatives to stingrays), exemplify an intriguing organism to study as they exhibit multiple modes of locomotion. Skates use their large pectoral fins to swim and glide through the water column in order to feed, they are also known to “walk” along the seafloor using their pelvic fins. Skates are benthic dwellers, and generally remain close to the seafloor, one of the ways they avoid predators is by burying into the sand, but how exactly do they do this? Do they wiggle their entire body to throw sand on top of themselves, similar to other benthic fishes? Or do they use a different functional approach to achieve a similar result? Using video recordings of skate burial we can then analyze their behaviors and thereby describe the biomechanics that dictate burying in big skates (Raja binoculata). Once we understand how skates bury we can test to see how the size of sand grains changes their burying behavior. Changing the effective grain size is a proxy for different habitats and allows us to look carefully at the ecology and burying preferences of the big skate. Another behavior that has been observed in skates is spy-hopping. Spy-hopping has been documented in many marine organisms, including sharks and flatfishes, but is most commonly seen in dolphins and whales, where one’s head is elevated above the water line. Spy-hopping and burying are both characteristic behaviors that have been observed in skates, yet the mechanical functions of these actions have yet to be quantified. Through this work I hope we will be able to evaluate the differences in skate burial compared to other fishes and how skates spy-hop. These studies ultimately are an evaluation of modified locomotion presented by the unique anatomy of the fins in skates. Many fish have evolved mechanisms to rapidly bury their bodies in the sand — a behavior that allows them to evade potential predators and ambush prey. At Friday Harbor Labs, students will study the mechanism of burial with a focus on anatomy and fundamental physical principles. What body movements enable fish to move their bodies into a solid-like substrate? What substrates (mud, sand, cobble) can fish exploit for burial? How does the relationship between fish and substrate change as fish change in overall body size? How do fish with different body shapes produce burial behaviors? In the summer of 2019, we will investigate these questions using two experimental organisms with very different body shapes: English Sole (a flatfish) and the Pacific Staghorn Sculpin (see Figure). Students will use a variety of experimental methods to address these questions, including: habitat preference studies, video analysis of behavior, experimental manipulation of substrate size, and modeling of organism-substrate interactions. While working on the project, students will be trained in a wide range of techniques, including high-speed videography, CT scanning, and physical-model building. At the end of the project, students will be encouraged to present their research as a poster or oral presentation at the annual meeting of the Society for Integrative and Comparative Biology in January 2020. 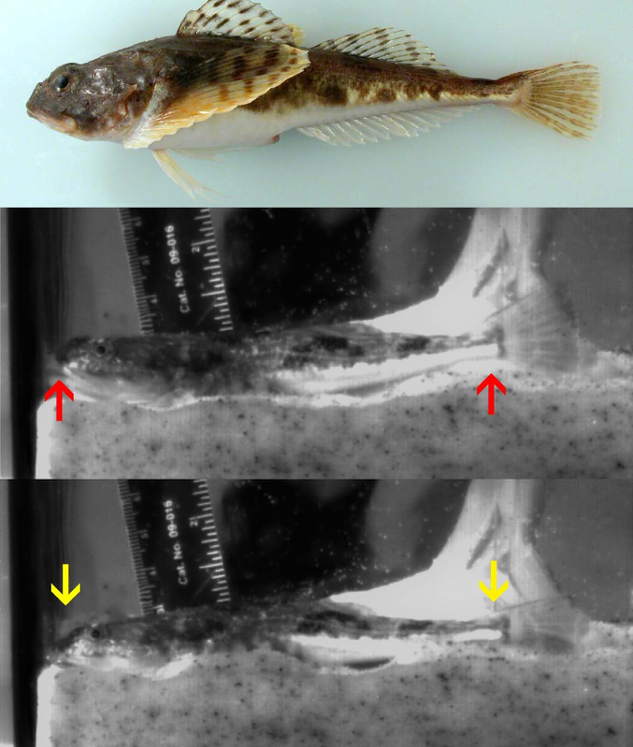 Pacific Staghorn Sculpin use the head and tail fin in repeated cycles of dorsal-ventral oscillation (red arrows indicate upward movement, yellow arrows indicate downward movement) to bury in the sand. Predation is a key factor that drives evolution and shapes ecosystems. It affects the prey’s fitness directly, by reducing survival. Body armor is one of the most commonly found strategies in nature to face the threat of a predatory attack. It has evolved in multiple species and generally comes with a trade-off between defense and maneuverability. Investigating body armor is of special interest because it tells us a lot about the organism’s ecology and environment. Is it under high predatory pressure? What kind of predatory threats does it have to thwart? Addressing such questions helps us understand the predator-prey relationships this organism encounters and how these might be stabilized in terms of population fluctuations. In fishes, a vast variety of body armor is found, ranging from none at all, e.g. most ocean-living eels (Anguilliformes), through fish that are partially armored, e.g. some stickleback species (Gasterosteidae), to heavily armored fish like some poacher species (Agonidae). The poacher body armor is composed of heavy bony scales and varies among species. Although the variety in poachers’ skeletal, cranial and postcranial morphological traits has been studied to some degree, little is known about the postcranial scales and their function as body armor. 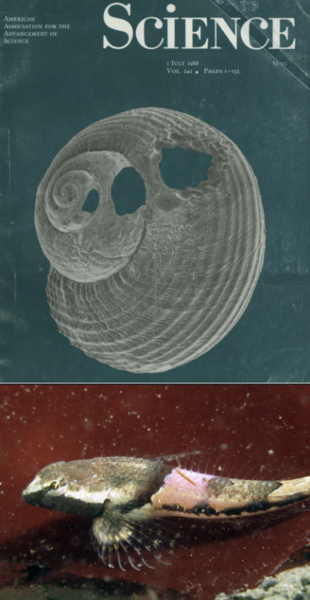 The scales are ‘typical concentric layered fish scales’ but are augmented with trabeculae (small bony beams) which build a bony network on the scales’ surface, and in some species converge into a spine on the dorsal scales. In this summer project we aim to determine the trade-off between body armor and maneuverability in poachers. Students joining me in this project during summer 2019 will work using biomechanical methods in order to evaluate the body armor’s material properties. Students will also use imaging methods (e.g. microCT and SEM) to determine the morphological characteristics that limits maneuverability. Thus, basic skills in biomechanics and (3D) imaging as well as (3D) image analysis will be obtained during this project. 12. 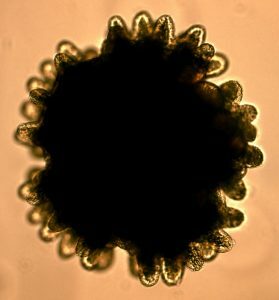 How are echinoderm larvae responding to environmental changes in the Salish Sea? The recent IPCC report predicts that due to increased ice melt and precipitation, the salinity of surface waters in the Pacific will decrease. There are more than 15 rivers emptying into the Salish Sea in the Pacific Northwest including the Fraser River, the second largest in the region. Wind direction and strong tidal currents determine the River’s effects in the San Juan Islands. Data collected in surface waters by the FHL weather station to the south of the Fraser River has revealed an increase in the amplitude and frequency of low salinity waters into the area during the spring and summer months. Unfortunately, this coincides with the reproductive season of many marine invertebrates including many echinoderms with planktotrophic larval development e.g. the sand dollar Dendraster excentricus and the seastar Pisaster ochraceus. Depending on food availability and physical conditions, larvae can remain in the plankton for between 20 – 228 days. Larvae may thus be exposed to very low salinity surface waters for a considerable length of time. Recent studies in my lab indicate differences in morphology (George and Walker 2007 and Pia, et al. 2012), vertical distribution (Bashevkin et al. 2016), particle capture (Navarro et al. in prep), and proteins expressed by larvae exposed to multiple low salinity events during development. During the summer of 2019, REU students and I will use a variety of echinoderm larvae to continue research on their swimming behavior in haloclines and particle capture under different environmental conditions. Larvae from each species will be exposed to high temperatures (15-18°C), temperatures typical of the San Juan Islands (11-13°C), low (20-25‰) and high (30‰) salinities characteristic of the region. 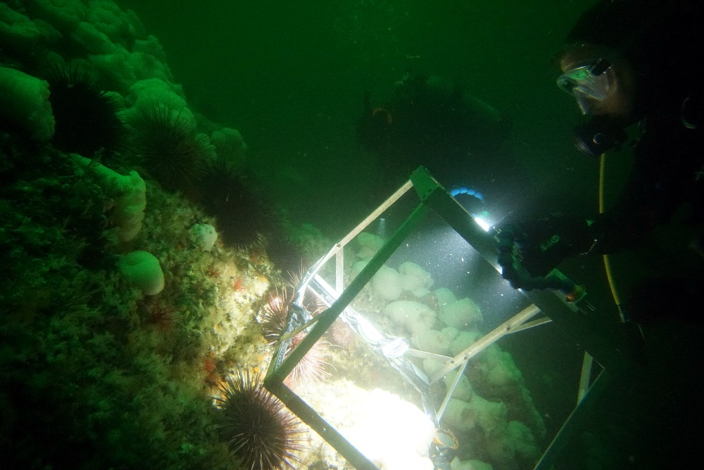 Results from this study will give us a better understanding of the response of echinoderm larvae to environmental changes in the Salish Sea. 13. Chasing Molgula tails: the molecular basis of the evolution of larval tail loss in tailless ascidians. Tailless ascidians have evolved several times independently within the molgulid ascidians. We will spend the summer exploring the molecular basis of the loss of taillessness, examining gene expression in embryos through in situ hybridization. We have three different genes in a gene complex that have been implicated in being responsible for tail loss, manx, bobcat and NA-14. We will look for the gene complex in Ciona and Boltenia, or in other Molgulids, such as Molgula pacifica. We will have the opportunity to publish the changes in the promoter regions between each gene as a molecular evolution paper and the gene expression as an EvoDevo paper. Sea anemones and corals are dominant space competitors in the benthic environment, frequently excluding other species forming monocultures. 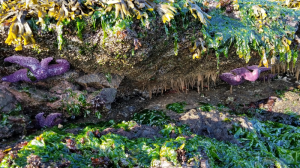 In this project, we will explore the patterns of distribution of anemones around the San Juan Islands and the processes that lead to these patterns. Projects will include lab and field work determining the impacts of abiotic and biotic interactions on survival of the local anemones and corals. Some specific projects include transplanting anemones from one depth to another via SCUBA or snorkel to explore distribution patterns, examining the benefits and costs of sea anemone aggregations in lab through predation experiments, or caging out predators in the subtidal. Subtidal experiments involving SCUBA may be possible for a student already certified by an AAUS member institution as an AAUS scientific diver.